More spots before my eyes! 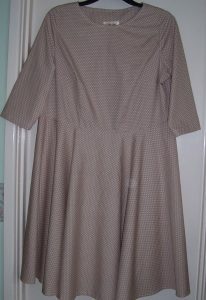 Using the refined bodice pattern from “Back to Basics” I made yet another dress featuring spots! Firstly I must say that I do not count this dress as a particular success. There is nothing wrong with the fit or construction only that so much light tan and white simply does not suit my complexion. 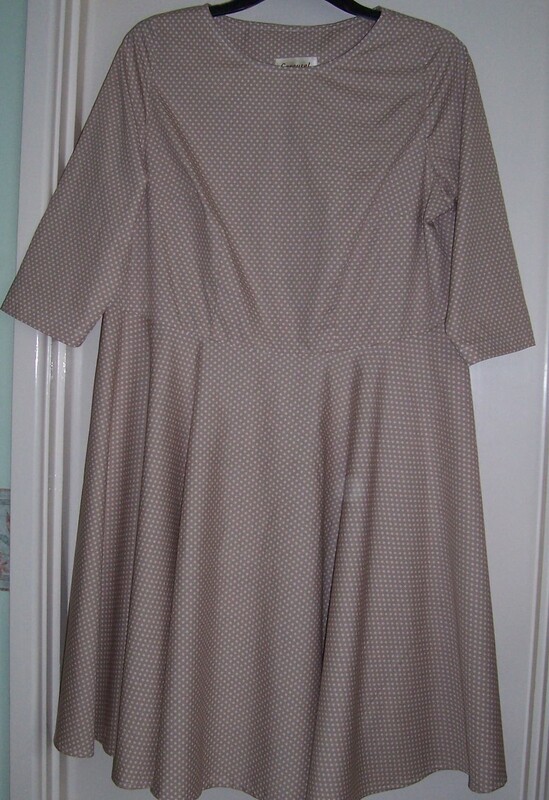 However as this dress has longer sleeves it will be suitable for wear with tights and a gilet during the colder months of the year. The fabric is a 100% cotton from Fabricland and was pulled from my stash so that I could audition the longer length sleeves combined with a hack bodice from the Back to Basics shift dress. Apart from the fact that the colour does not suit, the neckline is also close to my throat and in the short time that I wore the dress I found that it rode up and was very constricting. There is little more to say but bearing in mind the amount of fabric used in the full circle skirt it may well be re-cycled into something a little less “in your face”.